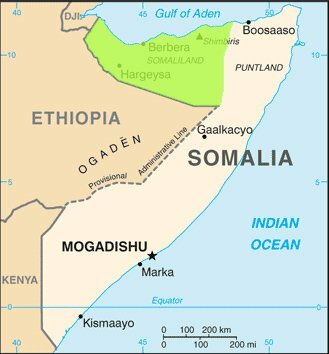 A motion that was to increase dialogue between Somaliland and Somalia has unexpectedly been rejected by the latter. Somalia's parliament leadership has dismissed a motion forwarded by a group of lawmakers to discuss the agreement signed between the Somali Federal Government and leaders of Somalia's breakaway region of Somaliland, Garowe Online reports. The parliament meeting was held Saturday [27 April 2013] in Mogadishu and attended by 170 MPs. Mahad Abdalle Awad, Deputy Speaker of Parliament who chaired the session, declared that the motion forwarded by the MPs is "illegal" and "could not be discussed in Parliament". Deputy Speaker Awad said: "We have provided the Federal Government the confidence to advance the country's politics. The Constitution does not allow us [Parliament] to interfere in the Government's agreements." Some federal parliamentarians expressed their frustrations with the parliament leadership's decision. Speaking at parliament, MP Ali Khalif Galayr accused the Somali federal government of "recognizing Somaliland" as an independent country. The agreement, signed on April 13, 2013, in Ankara and mediated by the Turkish Foreign Minister, was signed by Somali Interior Minister and Somaliland's foreign minister. President Hassan Sheikh Mohamud and Somaliland's leader, Ahmed Mohamed Silanyo, witnessed the signing ceremony in Ankara alongside Turkey's foreign minister. The agreement called for continuation of "dialogue" between the two parties, but did not clarify any clear position regarding Somaliland's bid for international recognition as an independent country.